I've had to change my 'current obsession' back to les macarons. I've been making them a lot more often this year. I'm still not sure why I love baking them so much. They are really hard work and I am usually so impatient! I made these for the lovely people at my work. We had a 'Summer Social'. Yes, at the end of September. So I made Autumnal themed macs. They are flavoured with a hint of cinnamon and filled with a milk and dark chocolate ganache. I tried to get a subtle orange-y brown colour. I didn't want them to be too 'Halloween-orange' or look like they were meant to be orange flavoured. I'm still using gel based food colourings, but I think I'll have to try the powdered ones soon. They went down really well. I thought they were a little on the rustic side, but no-one seemed to notice. Maybe because one of my colleagues made Nigella's Chocolate Guinness cake and it was freaking awesome. 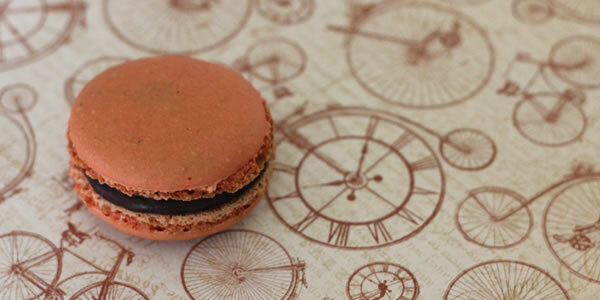 For the first time ever, I'm posting a full recipe with my macarons. Please read it all the way through before you decide to make a start. I use the Italian meringue method which involves hot sugar so please be careful. Makes: about 18 full macarons. Takes: some time. Red and yellow food colours (or orangey-brown if you have it) - not the liquid ones. - Firstly you'll need to make these the day before you want to eat them. - Take the ground almonds, icing sugar and cinnamon and grind them together in a food processor or spice grinder. Then spread the mix out on a baking tray to dry out. You can do this in a slightly warm oven if it's damp in your kitchen. -Weigh out your egg whites into two sets of 54g each. - Sieve the almond/sugar mixture into a bowl and add 54g of egg whites and a small blob of red and yellow food colouring. - Mix together really well into a smooth paste. - Put the other set of egg whites into a sparkling clean bowl and whisk them until it forms soft peaks, it will still be a bit foamy looking. - Put the granulated sugar and water in a small pan and start to heat it gently. Don't stir it. Keep an eye on the thermometer. - When the sugar solution reaches 118c take it off the heat. - Pour the hot solution in a slow stream into the eggs whilst continuing to whisk. - Whisk until the mixture gets nice and shiny and check the temperature is below 50c. - Fold the shiny mixture into the almond paste. - Get a piece of printer paper. Using a upside down shot glass or a set of compasses draw a set of circles with a couple of cm gaps between them. Or download a template - like this one. 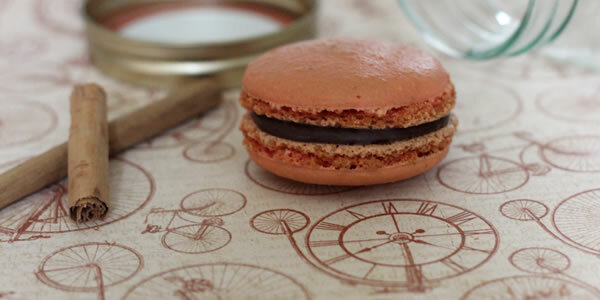 - Put a wide circular tip in your piping bag, place the bag in a glass and load it up with macaron mixture. - Put your template on a baking tray and cover it with a layer of parchment paper. - Pipe out circles until you have filled a tray. Then tap it on the counter to remove any air bubbles and the bobble on the top left by piping. - Continue to fill trays this way until you have no mixture left. - Leave the macarons to set and form a skin. Your finger shouldn't stick if you touch it. It takes about half and hour, but can be longer if it's humid or has been raining. - Set you oven to 160c (fan) and let it get up to temperature. - Put your first tray of piped macaron mixture on top of another (empty) tray and place it in the middle of the oven. - Leave the oven door open a little bit (use a wooden spoon to prop it open) and cook for around 10-12 minutes. They shouldn't 'wobble' when they are done. I also like to turn mine around during cooking as I use a fan oven and they sometimes rise unevenly. - When you take them out let them settle for a minute or two then gently peel them off the paper. - Let them cool completely on a rack. - Do the same with each tray. - Whilst they are cooking, make the ganache. - Break up both kinds of chocolate into a bowl. - Microwave or heat the cream in a pan until it is just about to boil. - Pour it over the chocolate and leave for a minute or two, then mix thoroughly until there are no lumps. - Put the mix in the fridge to set. - When all the macaron are cool, match them up in pairs. If your piping was really good, they'll all be the same size. I usually have a few that are a little larger. oops. - The ganache should have set enough that you can pipe it. If it has gone really solid - like a truffle - just heat it a little to get the right consistency. - Pipe a blob of ganache on one side of each pair and pop the top on to flatten it out. You should be able to see it at the sides but not have it ooze out. - Put all the macarons in an airtight container and pop them in the fridge overnight. - Remove them from the fridge 30-60 mins before serving. If they didn't come out like you expected - try a troubleshooting guide like the one at foodnouveau.com.